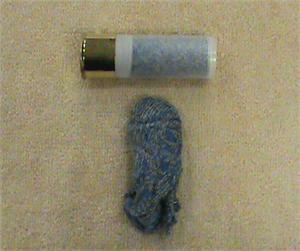 Our Mean Bean Bag is a heavy hitting Less Lethal round, with #8 birdshot in the sock. This round is designed as an animal control round and not intended to be shot at a human. However if your were to shoot a human, they must be 21 yards away and you must fire at waist down. There is no such thing as a "non lethal" round. Do not do something stupid!! !